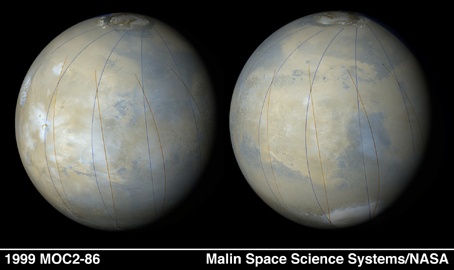 These two images are sythetic views of Mars made by combining Mars Global Surveyor (MGS) Mars Orbiter Camera (MOC) wide angle images from several orbits during the first week of March 1999--during MOC's focus and calibration testing period. The blue and red lines are the edges of the original pictures. Views such as these will be used throughout the MGS Mapping Mission to characterize the changing weather patterns on Mars. Right now, it is northern hemisphere summer on Mars, and the north polar ice cap can be seen at the top of each image. In the view on the left, thick blue-white afternoon water ice clouds can be seen surrounding and obscuring the northern-most of the large volcanoes of the Tharsis Montes region (left), and clouds can also be seen over Lunae Planum (center) and Chryse Planitia (center right). In the right image, faint clouds are seen over Arabia (center left bright region) with somewhat thicker clouds seen over Syrtis Major (dark, triangular region toward the right). Very thick southern winter clouds can be seen "ponded" within the Hellas Basin near the bottom of the frame.